Does a diplomat owe his loyalty to his monarch or his mission? Can they be different things? Would a career diplomat throw his future away by taking the other side of an issue? It happened at least once in history. In Cornwall on 17 June, 1268, Borin and Helena de Herle had a son, Borchard. He had a difficult youth: there is a claim that his father was abusive to his sons; typhoid fever killed his father when Borchard was 12, and crippled his mother; at 17 he killed his brother (Leofric, who was 16) in a duel over their inheritance. At 18, Borchard left home to study law at Cambridge. The university education made him attractive to the crown, and at the age of 20 he became a diplomat under Edward I. The role of a diplomat then was much the same as now: to represent your country in difficult dealings with other countries. He was sufficiently active in France that a book on the 13th century in France features him heavily. Closer to home, however, he made a political mis-step that would cost him his head. In the century of Borchard's birth, conflicts between Scotland and England were numerous. Many wealthy Englishmen became landowners in Scotland, and treated the local Scottish workers poorly. Revolts of Scottish workers were common, and to one such revolt—in which English were taken hostage by the Scots—Borchard was sent to settle things. Arriving on 17 February, 1305, with authority to use force to end the problem, Borchard decided to take a different approach. He negotiated with the captors to release the English hostages. Unfortunately for him, something motivated him to go further. He helped the Scottish peasants plan another rebellion that would result in the death of 10 English landowners; it was staged to look like they had gone against Borchard's advice and absolve him of responsibility. Why did he do it? Did he promise them something else, like victory over the English in exchange for rewards to Borchard? Did they offer him some of the land? Did he "snap" because of an abusive father? We cannot know. 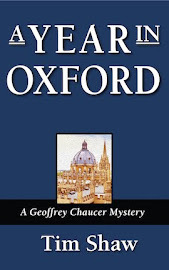 Returning to England on 29 March, his fortunes quickly went downhill. Another member of the diplomatic mission, Henry de Bohun, reported Borchard's suspicious behavior to the king. These suspicions, and the second rebellion and deaths of Englishmen, gave Edward cause to declare Borchard a traitor. He was beheaded shortly after his return. When your religion is centered on a holy text, and a majority of the population cannot read, how do you bridge the gap between a devotional spirit and the obligation to certain prayers? A prayer rope. The creation of the prayer rope, the use of which arose with monasticism in Egypt in the 3rd or 4th century CE, is attributed to St. Pachomius. Considered a precursor to the Christian Rosary, it gave early monks a mnemonic device for achieving their daily prayer goals. 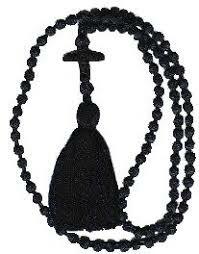 The prayer rope was a circle of knots, intended to be fingered as one went through the daily devotions. Carrying it by itself was a reminder to pray, but the knots would remind one of the specific number of prayers needed to meet a daily obligation. Prayer ropes have been found with as few as 10 knots (and wearable on a finger) and as many as 500. Some numbers can be assumed for a reason: 33 for the years of Jesus' life, for instance, or 150 for the Psalms. Beads are sometimes present at intervals along the rope. Construction of a prayer rope was not a random act. They were usually made from wool, to represent Jesus' flock. A cross was attached to the place where the two ends of the rope were joined, with sometimes a tassel added. Although traditionally a black rope to represent our sinful state, the tassel often had red in it, to represent Jesus' blood. When weaving and knotting one, the maker should be praying the entire time. Not to be worn as a necklace or dangling from one's clothing, the rope is carried wrapped around the left wrist. When in use, the left hand holds the rope, counting the knots between thumb and forefinger. The right hand is left free to make the Sign of the Cross. The prayer rope is still in use in many parts of the world. The Peasants' Revolt of 1381 was mentioned last year over a five-day span, but the events in London weren't the only expression of lower class unrest that month. Word of the rebellion in London sparked similar group actions elsewhere in the kingdom. Revolts took place in Bury St. Edmunds, Cambridgeshire, Ipswich, St. Albans, Thetford, and numerous other locales. At a time when 90% of the population was agrarian and existing in a system in which they could feel controlled and oppressed, it was easy to get large crowds stirred up. The ruling minority, on the other hand, took a little longer to muster an armed resistance capable of suppressing the rioting. In the north of England, for instance, word of rebellion in London reached John of Gaunt on June 17 in Berwick-on-Tweed on the border of Scotland. He was too far from London to do anything about the events there, but he sent messengers to his castles in Yorkshire and Wales to be alert. By this time, Wat Tyler had been killed in London a few days before, and the Revolt there was being dispersed, but John did not know that. Also on the 17th, word of the revolt came to York, inspiring the lower classes to attack the estates held by Dominicans and Franciscans. York and Scarborough were in upheaval for months until the established authorities were able to re-assert control with the help of armed men. When Edward III is mentioned in this blog, it is often in connection with the Hundred Years War between England and France. Expanding his "little island's" authority was an important feature of his long reign. So it might come as a surprise to learn that he was responsible for a non-aggression treaty with another European power—a treaty that has been in effect for almost 600 years! It didn't hurt Edward to have a friend on the continent. It gave him a potential place to land ships if he needed to march through (or against) Spain for any reason. The alliance helped Portugal as well. During political troubles in the 1380s, John the Good (called João in Portugese) defeated his rivals; England recognized him as the rightful king of Portugal right away. Spain would not recognize his right to rule until decades later. England reinforced the 1373 treaty in 1386 with the Treaty of Windsor, as a result of which King John I of Portugal married Philippa of Lancaster, daughter of John of Gaunt, Edward III's 4th son. Does the treaty have any real significance in the modern world, considering the United Nations, NATO, etc.? Well, it is said that during World War II, Portugal refused to join the Axis powers in order to stay loyal to a 550-year-old document! In the first paragraph, I said the treaty had been in place for "almost" 600 years, but wouldn't the date of 1373 mean it was in place for 640 years? Or, given that the treaty wasn't ratified until 1386, couldn't I have said "over" or "more than" 600 years? Well, I must be honest: the treaty wasn't always in effect during that time. From 1580-1640, due to marriages between the royal families of Spain and Portugal, Portugal was obligated to drop the treaty with England, Spain's enemy at the time.